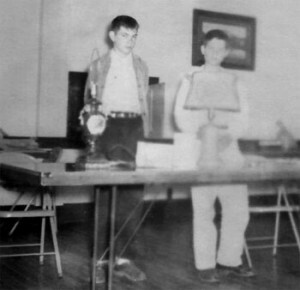 Oregon 4-H’ers in the 1950s demonstrate how to re-wire lamps at a club meeting. Many of us take electricity for granted at home, at work, and at local stores and businesses. But that wasn’t the case seventy-five years ago, especially in rural areas. An article in the 1939 National 4-H News invited 4-H members to participate in the 4-H Rural Electrification Project. Members and clubs were “encouraged to study wiring plans, safety practices, and operation of electrical equipment.” Members were encouraged to complete activities to help them learn to make basic electrical repairs and additions at home and on the farm. Project records were submitted to compete for county medals, trips to National 4-H Congress, and $200 scholarships. Early electrical club work even inspired a novel to be written. “Dynamo Farm” by Adam Allen, and published by J. B. Lippincott Company, NY in 1942 tells the story of a boy from the city who moves to a farm and learns to love being there because he gets involved in an electrification project in 4-H and saves the family poultry business. Electricity is still an important 4-H project. Members learn the principles of electricity, circuits, magnetism and safety. These days, energy conservation is also emphasized. You and your club members can learn about electricity like the 4-H members did in the 4-H Rural Electrification project many years ago. A club member or guest speaker can do a demonstration or lead a club activity to learn about electricity. Club members can do a home energy audit and share their results at a future club meeting. Or you could try to find a copy of the novel mentioned above and share a report about it or act out some of the scenes for the club. This entry was posted in History and tagged 4-H Electrification Projects, 4-H History by Jim Kahler. Bookmark the permalink.